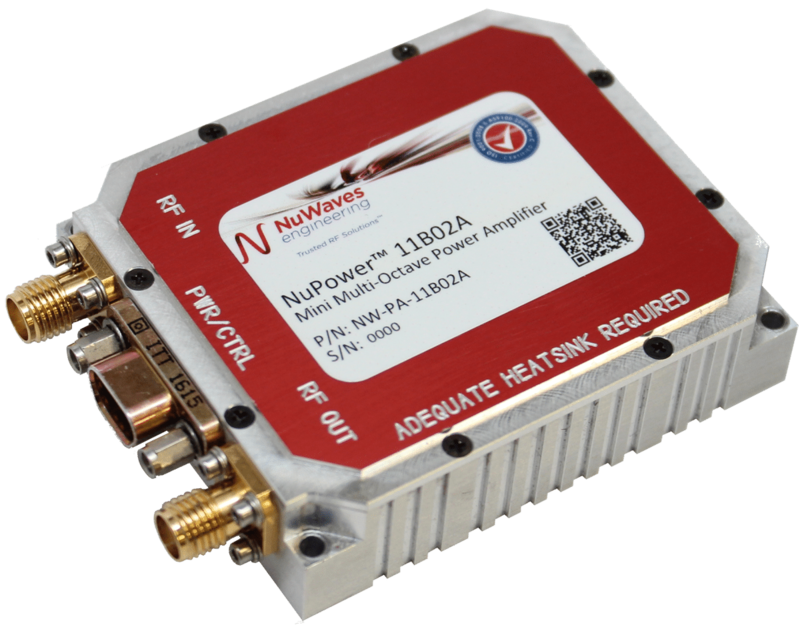 The NuPower™ 11B02A Mini Multi-Octave PA (MOPA) is a broadband, high-performance miniature solid-state power amplifier delivering 10 watts* of RF power for CW and near-constant-envelope waveforms across the frequency band of 200 to 2600 MHz. The NuPower 11B02A is the only model in the NuPower family which features low, medium, and high power “back-off” settings in support of linear waveform operation or to trade off output power in exchange for lower power consumption. The NuPower 11B02A’s rugged chassis allows the system integrator to easily incorporate the unit into a platform operating in harsh environments with limited space, such as small Unmanned Aircraft Systems (UAS). The miniature form factor of 2.84 cubic inches brings state-of-the-art miniature power amplifier technology to the war fighter, meeting present challenges in size and weight reduction. All NuPower PAs come standard with a Micro-D interface cable with 18″ flying leads. An available option for the Mini MOPA is an accessory kit (p/n NW-PA-ACC-KT02), which includes a fan-cooled heat sink, and an interface cable assembly with banana plug terminations for lab testing. * The NuPower 11B02A will provide 10 watts (typ) RF output power across 200 MHz to 2.6 GHz with an input drive level of +3 dBm.